The mood for 2018 is big, bold brows. Gone are the days of the barely-there brows of the early 2000s—to serve looks nowadays, the term “thicka than a snicka” expands not only to your backside, but to your eyebrows as well. Brows that are thick enough to teeter unibrow territory have been heavily celebrated as of recently, thanks to the likes of Instagram influencers drawing and editing on bushy brows that would make Cara Delevingne jealous. While big, bold brows may feel like a new trend, they’ve actually been pretty popular within the decades of yesteryear. It just seems like a fresh and new concept due to the 1990s and early 2000s: supermodels and actresses rocked razor blade-thin strips of eyebrow hair, paired with other questionable beauty trends (the glitter, the waxy lip smackers lip balm—it’s all so cringeworthy) during that 20-year era. Although eyebrows have seemed to take on a new form by each and every decade that passed, thick brows actually came about in the 1950s. Vintage starlets like Eartha Kitt and Elizabeth Taylor were known for their dark, dramatic brows with sharp arches that could cut through glass. Women around the globe would try to emulate these full and shapely brows by using dark shadows and brow pencils to create their look, and the trend lasted until Twiggy came onto the scene in the 1970’s. Thick, voluminous brows has made quite a few comebacks from then on, with Brooke Shields and Madonna sports fuller brows within the 1980’s. But, the fullon tweezer-free phenomena really didn’t hit the world until the 2010s, due to the rise of Kim Kardashian and Cara Delevingne. And due to the wide array of cosmetic procedures that are available now, people are microblading and permanently dying their brows in order to give them a more defined and faux-naturally bushier look. However, the problem with these permanent procedures are that beauty trends fade, but permanently tattooing your eyebrows do not. That’s why we’re going for the more reliable, temporary option: the eyebrow pencil. This makeup essential has come a long way from its inception: there are now hundreds (if not thousands) of varieties to choose from in a mix of shades that look almost identical to your brow hairs. And as a bonus, most of the formulas around are now waterproof, so you can feel free to take a dip in the pool or sweat away at the gym with perfect brows sketched seamlessly onto your face. We know that picking can get tough, especially with all of the choices you have to pick from—so, let us do the work for you. These brow definers are tried and tested, and are known around the globe for their hair-like precision and true-tone pigments, making them truly the best waterproof eyebrow pencils you could find in 2018. So, don’t let your brows fall flat, give them some life with these top of the line waterproof eyebrow pencils. Define and conquer the brow game with the best eyebrow pencil for your brows. For full, ultra-defined brows, reach for this liquid brow liner from MAC Cosmetics. This liner let’s you give your eyebrows a whole new identity: the ultra-fine liquid liner felt tip creates hair-thin strokes that will effortlessly take your brows to the next level. This eyebrow pen also has a sponge tip to distribute tinted powder to set your brows into place while adding just a touch of added pigment. The results: perfectly sculpted brows that will stay put from dusk to dawn. This is the ultimate weapon against patchy, unruly eyebrow hairs for it’s dual ended tip and longwear, waterproof formula. 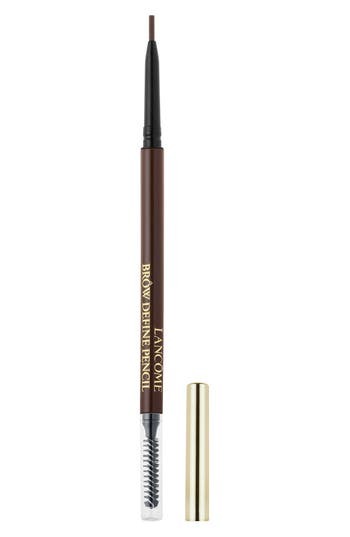 To create a more toned-down, natural effect, then reach for this fine-tipped brow pencil from Lancôme. This brow defining pencil stay simple in design with it’s precision tip that allows you to create the thinnest of strokes. So, whether you want a slightly enhanced finish to your eyebrows or want to make them bolder and sharper than daggers, you can easily do so with this eyebrow essential. If your bushy brows seem a little too unruly, you can easily brush them into place by swiping them with the attached spoolie end. Use this eyebrow pencil to create a more minimal, everyday look. When you’re bolting out the door to catch your morning commute, there’s very little time to spend on your brows. That’s when you should whip out this eyebrow pen & gel duo from Smashbox. This thick-tipped pencil is basically a foolproof tool to use for crafting big, bushy brows. It fills in any major patches, spots, and uneven places in as little as one swipe, and he soft-hold gel lets you create a bushier, faux-natural finish without leaving a crunchy finish or gross residual feel. The waterproof formula allows you to run around during humid, sweaty days without caution for a full 16 hours. At the end of the day, we all just want nice eyebrows. We can draw them on as much as we want, but how can we actually improve our misbehaving hairs? By grabbing this eyebrow pencil from Urban Decay, of course. This brow pencil not only has a long-lasting waterproof formula, but is also infused with nourishing ingredients to help give your brows a hydrating treatment. Vitamin E, argan oil, and coconut oil work together to moisturize your brows and skin, creating a smoother application without any brow-harming pulling or tugging. The unique texture creates an ideal laydown for color that lasts all day long. Keep your eyebrows fully groomed and under control with this pencil from the geniuses over at Sephora. This revolutionary eyebrow pencil has a hair-thin tip to create the most intricate of strokes, allowing you to have full control over your finished look. But, what really makes this brow pencil stand out from the rest is its innovative brush end. This is no average spoolie — this winged tip creates a fluffier, in-depth brushing that will enhance your brows to a whole new level. This winged tip is also great for trimming and applying brow serums for a healthier-looking finish. Give your brows a seamlessly sharpened approach with this waterproof brow enhancer from Chantecaille. This brow pencil is fine enough to create ultra-thin strokes for a more natural finish, and is infused with avocado oil to pamper your hairs and follicles for the full inside-out treatment. Softer, healthier brows are just a few swipes away with this angular brush and spoolie duo. This eyebrow pencil from Laura Mercier comes in eight different shades, making it one of the largest color ranges in the eyebrow game. And not only are these shades perfectly pigmented, but they easily glide on without any spotting, fading, or pulling. The fine pencil tip creates hair-like strokes, and the spoolie allows you to blend your brows to perfection, so you’ll have no fear of creating the dreaded fake-looking block brows. Last and definitely not least, we have everyone’s favorite eyebrow pencil. Anastasia Beverly Hills is known for their brow godsends, with this pencil being the most iconic. I may be a bit dramatic, but this pencil has revived the life of my brows, and I will never turn my back on it. The ultra-fine tip lets you create hair-thin detail, and the slim packaging makes it as easy to maneuver as your favorite pen. And honey, the pigment is to die for! There’s a reason why everyone loves this eyebrow pencil so much: because it really, really works.